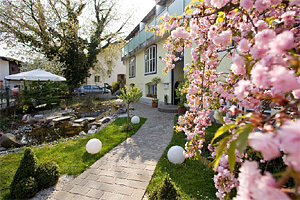 Only few minutes′ walk from the historic centre of Salzburg, in the Hotel Rosenvilla you will find an idyllic home during your holiday in Salzburg. 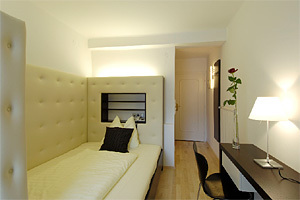 Petra and Klaus Fleischhaker guarantee individuality, the best service and intimate hospitality. In the romantic rooms and suites of this four-star hotel in Salzburg you will find everything you need for your wellbeing. 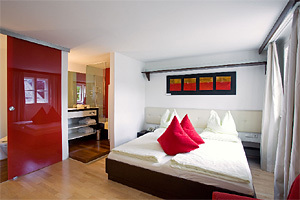 Modern comfort and all of the services one can expect from a hotel of superior category with excellent value for money. Take some time to start a wonderful day with a wonderful breakfast. 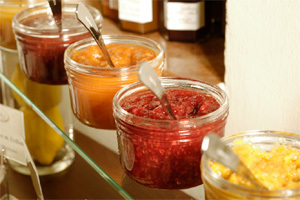 With homemade jams and cakes, different antipastis, fruits and joghurts, homemade butter and bread and much more. The exquisite breakfast at the "Rosenvilla" does not leave anything to be desired - our hotel is famous for it. 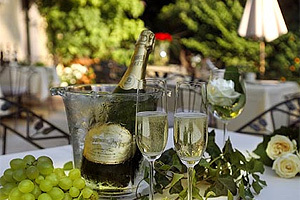 This is only one of several packages that are available at our Gourmet Hotel. Through our website, you can make a non-binding enquiry now. The city of Salzburg is popular among couples from all over the world who wish to marry. The city of Mozart with its world-famous registry office in the Marble Hall and the numerous beautiful churches is simply ideal to marry. 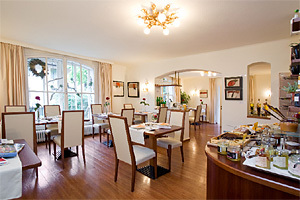 Marrying in Salzburg is a dream that many guests wish to fulfil at the romantic Hotel Rosenvilla. Moreover, Salzburg is ideal for a honeymoon: the city is imbued with a unique flair, the historic centre virtually radiates with romance. A special vintage car is ready and waiting to chauffeur you befittingly to your destination. The 1934 Rolls Royce brings you stylishly through the city to Mirabell Palace with its wonderful hall for the wedding ceremony. Enjoy the drive in this rare classic car, which can be booked exclusively at the Hotel Rosenvilla for your wedding in Salzburg. 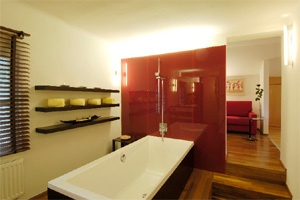 The honeymoon suites at the Hotel Rosenvilla are perfect for your start in married life. The Hotel Rosenvilla with its marvellously romantic and intimate character is the ideal place for those in love to enjoy their happiness. Secluded and quiet, but still centrally located, the hotel offers comfort and a private sphere for your honeymoon – the motto is small but refined at the Rosenvilla – simply perfect for wedding couples. From the Station: The No. 6 bus (direction Parsch) brings you from the main railway station almost directly to our hotel. Get off at the station "Volksgarten". Then change to bus No.7 and go one more station till "Finanzamt". Carry straight on and after about 50 metres turn right into the Höfelgasse. Our hotel address is Höfelgasse 4. From the airport: Take the No. 2 bus from Salzburg Airport to the "Gaswerkgasse" stop. Change there to the No. 7 bus (direction Salzburg Süd) and get off at the "Finanzamt" stop. Carry straight on and after about 50 metres turn right into the Höfelgasse. Our hotel address is 4 Höfelgasse.